Some dog behavior concerns are too involved and/or serious to be dealt with in a group setting. In such cases, private in-home training allows for a much more thorough and comprehensive approach to retraining your dog. All behavior counseling sessions are conducted by Linda Brodzik CSAT. With over 35 years of experience and continuing education in the science of behavior and learning and teaching theory, this assures you the very highest level of professional guidance. You will never be paired with a less educated or less experienced trainer. Check out Linda’s educational background and experience on her Bio page. Difficult to Groom/Brush/Clip nails, etc. Don’t see your dog’s issue on this list? Don’t worry — we’ve seen these plus a whole lot more! 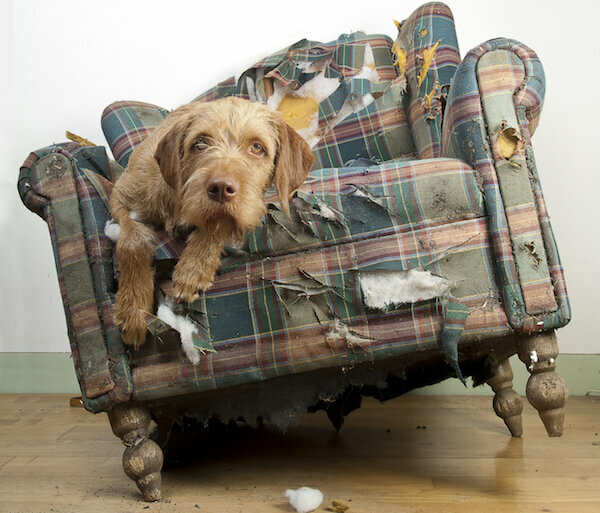 Contact us to discuss your dog’s particular behavior issue. When working one-on-one with dog owners, each client and case is met with individualized attention and concern. Consultations are conducted at the client’s home as we feel this allows for a greater opportunity for a thorough assessment of the concerning behavior(s) and the contributing factors. Separation Anxiety programs are conducted via live stream video (Skype, Zoom … ) as this has been found to offer the most effective training solutions to this behavior concern. Learn more about Separation Anxiety and how we use technology to better serve you and your training needs Here. Each behavior case is met with a comprehensive assessment and personalized guidance through a detailed, individualized retraining program. Emphasis is first placed on educating the dog owner in a better understanding of the dog’s behavior problem(s), and better teaching and management skills. We then take these skills and teach you how to successfully apply them to your dog’s retraining program. Equal emphasis is placed upon empowering both the owner and the dog with the skills and tools needed to be successful in your individual program and in real life situations. All training is based on scientifically researched and proven positive reinforcement based methodologies. On average an initial behavior consultation takes 1 1/2 hours to complete but could be shorter depending on the complexity of the behavior concerns. Should any further session be needed it would be scheduled in one-hour increments (these generally run one hour in duration). Clients are given continual and unlimited support as they progress through a dog training program. This is done through phone and/or e-mail conversations at no additional charge. In-Home Consults: $100.00 per hour. The first hour of any session is billed as a full hour, then in 15-minute increments at the rate of $25.00 for any time spent thereafter within the same session. Appropriate sales tax does apply to all training programs. On-Line Consults: $80.00 per hour. The first hour of any session is billed as a full hour, then in 15-minute increments at the rate of $20.00 for each 15-minute increment of time spent thereafter. Appropriate sales tax does apply to all training programs. Get the benefits of an in-home consult online. In the age of technology such as Skype, Zoom, and Facetime, we can meet online and get help to you fast. This interactive online session is perfect for addressing some behavior and training concerns. We can meet anytime that is convenient for you. Please contact us to discuss your dog’s specific behavior concerns and training needs and to schedule a private behavior consultation.